The Apache Druid (incubating) indexing service is a highly-available, distributed service that runs indexing related tasks. Indexing tasks create (and sometimes destroy) Druid segments. The indexing service has a master/slave like architecture. 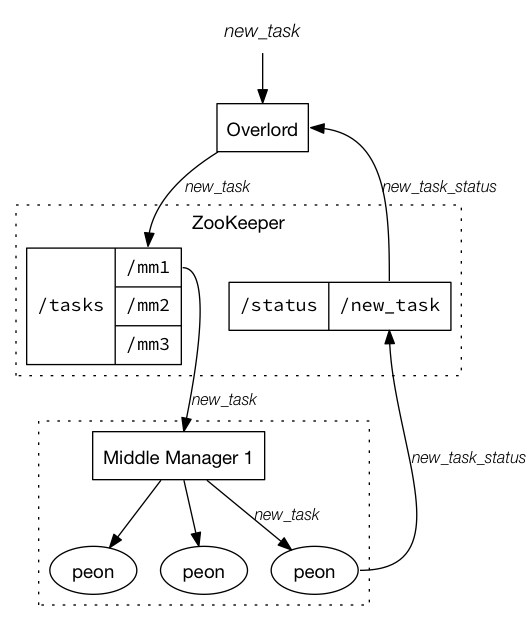 The indexing service is composed of three main components: a Peon component that can run a single task, a Middle Manager component that manages Peons, and an Overlord component that manages task distribution to MiddleManagers. Overlords and MiddleManagers may run on the same process or across multiple processes while MiddleManagers and Peons always run on the same process. Tasks are managed using API endpoints on the Overlord service. Please see Overlord Task API for more information.